A settlement called Spruce was established in 1902 near the headwaters of Shavers Fork of Cheat River. 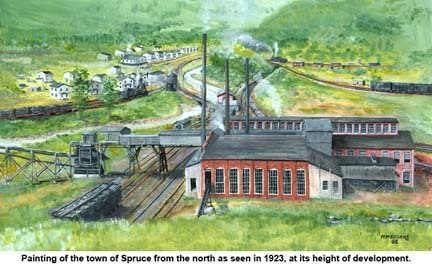 The location was renamed Old Spruce after the West Virginia Pulp and Paper Company (WVP&P) built a pulp mill and supporting community, called Spruce, about one and one half miles down river, at an elevation of 3,853 feet. Known as the "highest and coldest town east of the Mississippi," the Spruce complex was built during 1904-1905 to supply pulpwood for the company paper mills in Covington, Virginia, and West Piedmont (now known as Luke), Maryland. At Spruce, the tracks were originally in the shape of the letter "Y." The base of the Y pointed south toward Cass and the arms toward the west into the Elk River valley, and down Shavers Fork to the north. The rail lines out of Spruce had many branch tracks which tapped timber as well as coal. All this traffic was collected at Spruce, with three main yard tracks, each one about 1500 feet long. The Spruce Hotel, had electric lights, hot running water and steam heat. The mill, locomotive shop, company offices and the homes of officials, also had electric lights. The amenities made the hotel a phenomenon at the turn of the century. It was a two-story structure with a reported 30 rooms, housing company employees as well as transients. In a row south from the hotel were ten houses, five duplex and five single-family. The single houses were identical to the company houses seen at Cass today. The row of houses and the hotel were "Main Street," but, except for a wide boardwalk, there was no street. In 50 years as a town, Spruce never had a road. 1923 view of Spruce (artist's impression) East of Main Street was a row of three small houses and the two-room schoolhouse. Northwest of the hotel, was the company store. In a row, east from the store were the company office and a row of three or four single houses. Northeast from the store, along the yard tracks, was another row of five single houses. There also were a number of non-company dwellings for those who couldn't or wouldn't rent from the company. At the north end of town was the two-stall locomotive shop. At the south end of town was the railroad water tank, later replaced by a larger tank adjacent to the store. The mill complex was across the river. The sawmill produced only pulpwood: debarked, split, short slabs. This was shipped to company paper mills, often in special C&O pulp cars, slat-sided open-top cars, somewhat resembling livestock cars. While other mill buildings were wood, the power house was mainly brick, In the 1920's, concrete additions, the most visible remains today, were added. In 1925-26 the Spruce mill closed and the machinery was moved to the company paper mill at Luke, Md. ; locomotive servicing was transferred to the shop at Cass and the town was abandoned. In 1928-1929, the Western Maryland Railway took over the greater portion of the GC&E railroad (and the name) to take advantage of the developing coal industry of the area. WM railroaders moved into the town, which became a terminal for helper locomotives employed in pushing trains over the steep grades over the summit at Big Cut between Slaty Fork (Laurel Bank) and Spruce. Another bridge crossing Shavers fork was added at Spruce in 1929, forming a wye for turning locomotives. 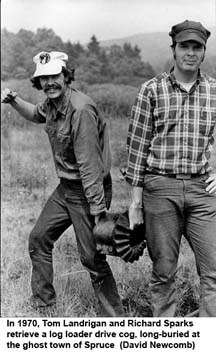 A new main line was built east of town, making a big horseshoe that crossed Shavers Fork at the south end of town and rejoined the original logging grade on the long climb toward the Big Cut. The new line went right across Main Street, eliminating one house. The earth fill for the Shavers Fork bridge was dumped right over the former logging main line, burying a stretch of track. The hotel was demolished. A sand tower and a tall 75-ton coaling station were added in 1931 near the water tower. In 1941 WM built a new engine house in the center of town. 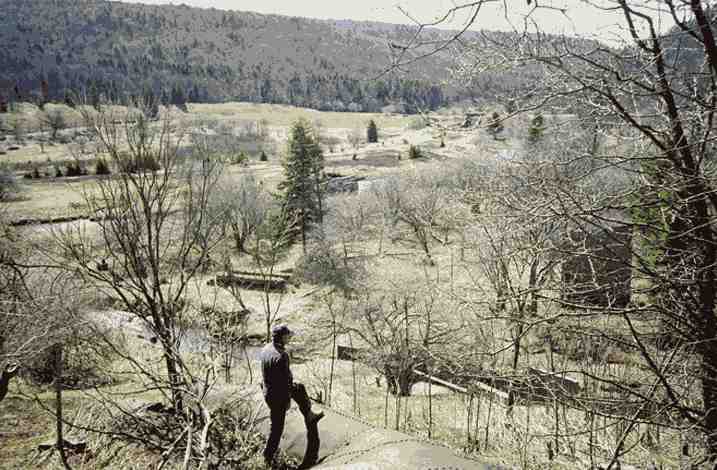 In October 1949 construction began on a new engine terminal at Slaty Fork which was to replace the facilities at Spruce. By 1951 the twenty plus families that had occupied Spruce for a quarter-century quickly left for other jobs on the railroad. In 1953, diesel locomotives made their first run over the branch. In December of 1954, the water tank was retired; in November 1956, the wye and remaining sidings were pulled out. Only a couple of houses were left for the occasional use of track gangs, and they were gone by the early 1960's. The most prominent terrain feature today is the hill inside the horseshoe curve. This is the earth moved in 1990 to build the new interchange between the Cass Railroad and the CSX (successor to the WM). This covers much of the former Main Street area. Next to the river, the railroad grades and concrete foundations of the WM shop and water tower are visible. Piles of sand and coal mark the location of the sand house and coal tower. One can easily spot the concrete abutments for the two bridges that carried the legs of the wye across Shavers Fork. Just upstream are the remains of the WM erosion control dam. Across Shavers Fork, there are still a few ties on the WM grades. On the mill site are foundations of the buildings, major machines and overhead conveyors. The steel uprights of the conveyor trestle and endless chain are easily found. Next to the river, there still is a large mound from the mill waste pile. Pipes and plumbing, and heavy chains are scattered all over the area. The mill pond dam is quite distinct and some of the old mill trackage is still in place, its rails over 100 years old. The outline of the powerhouse is readily seen in low mounds of shattered brick, and the stone footings for the big, single cylinder steam engines are still in place. The concrete addition to the west end of the building is standing and the tops of the brick fireboxes of the mill boilers are visible brick fireboxes of the mill boilers are visible. boilers are visible. There is also an album of photos, both vintage and modern, of Spruce.